Rich but clean tasting with a tangy bite, this deliciously easy spread makes a tasty last-minute lunch. Serve with toast or warm crusty bread. Using a fork, transfer the fish into a small bowl. Add 2 tablespoons of the olive oil from the can, the capers, parsley and a little sea salt. Mix lightly with a fork until the fish is flaked into small pieces. Add the crème fraîche to the bowl and stir until the ingredients are just combined. 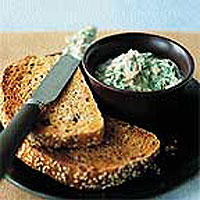 Serve with chunky slices of toast or warm crusty bread.